I have a weakness for tea scents. I love tea. I can’t drink it very much so I would at least like to smell like it. Unfortunately for tea, the notes that tend to make up its chemistry are fragile little things that are fleeting at best. 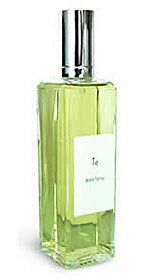 In Bottle: Spicy, bergamot and green tea. Te is a very nice pleasant and easily deciphered fragrance. It’s nicely blended but isn’t one-dimensional. There’s something herbal in this too. Applied: Bergamot and grapefruit followed by a watery green tea fragrance. The clove gives this a bit of spiciness that takes it away from just plain green tea and ushers it into a slightly more interesting scent. Celery helps lend this fragrance a more watery feel too while also making it smell just a slight bit vegetal. Fortunately the vegetal note is quick to fade along with the rest of the scent. Te is very light and very fleeting. The green tea and clove are the longest lasting notes as the rest of the fragrance seems to fade to very small proportions. After the opener, Te takes on a light, distant green tea scent that’s very faithful to how a cup of green tea would smell if you were to hover your nose above it. Extra: Creative Universe is headed by Beth Terry. Te was released in 1997. Design: Much like other niche or independent houses, Creative Universe keeps their packaging simple. Bottled in a big rectangular glass bottle, Te has a label on the glass identifying the fragrance name and the fragrance house’s name. Notes: Bergamot , grapefruit, green tea, celery, ylang-ylang, clove. Te is one of the very few tea fragrances that actually has good staying power. But, green tea notes do seem to be more robust than their black tea cousins. My quest for the perfect, long-lasting tea fragrance continues. Reviewed in This Post: Te, 2009, Eau de Toilette. This entry was posted in aromatic, creative universe, fresh, Reviews By House and tagged beth, creative, fragrance, green, perfume, review, scent, te, tea, terry, universe. Bookmark the permalink.